Everyone arrived safely in Milan Italy and we had an amazing day. The emphasis of the day was the amazing Duomo Cathedral which took hundreds of years to build and is one of the most beautiful churches in the world. Fr. 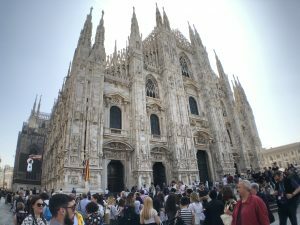 Fran’s opening homily in Milan Cathedral HERE. The Duomo is the 3rd largest church in Europe and it contains the baptismal font Where Doctor of the Church, St. Ambrose baptized Doctor of the Church St. Augustine. We renewed our Baptismal Vows there.